It’s OK To Be Smart/PBS Digital StudiosThe case is made of two different leaves. 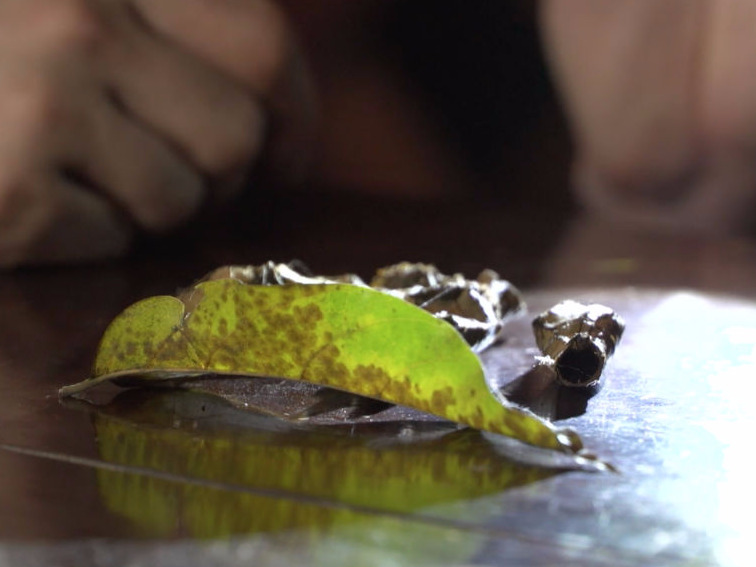 A caterpillar recently discovered in Peru behaves unlike any other known caterpillar. 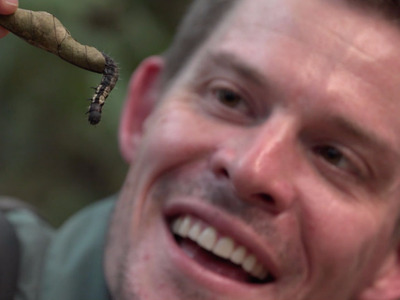 The critter was spotted by Dr Joe Hanson, the creator and host of the YouTube channel “It’s OK to be Smart.” Hanson, along with entomologist Aaron Pomerantz and guide Pedro Lima, were filming in the Peruvian Amazon when they came across the creature. According to Hanson, this is the first known example of a caterpillar building itself a mobile shelter, which is why it has earned the name of the hermit caterpillar. 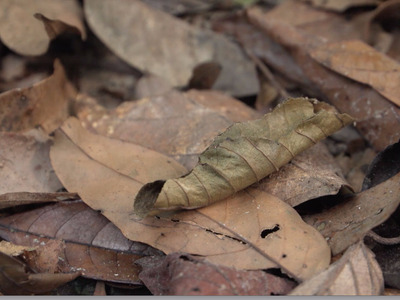 While they were filming, the team noticed that leaf litter on the rainforest floor was moving. Upon closer inspection, they realised a big, fat caterpillar was inside, dragging along a home it had built out of leaves. The very first moment the team noticed the hermit crab caterpillar crawling on the ground. Caterpillars are masters of disguise, but this one was something special. When Hanson picked it up, it retreated inside its protective tube. If they hadn't seen it moving, they probably would have walked straight past. Joe Hanson picked up the hermit crab caterpillar for a closer look. 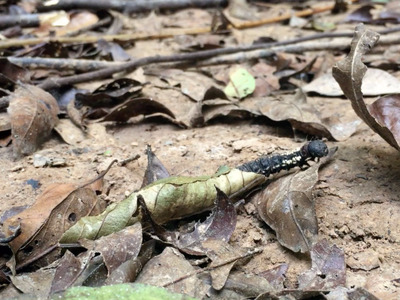 The caterpillar had cut and glued itself a custom suit of camouflage leaf armour, which it drags behind itself like a caterpillar version of a hermit crab. The only difference is hermit crabs move into homes another animal has left behind whereas this caterpillar made its own from scratch. 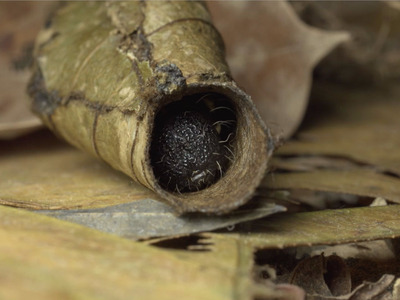 When threatened, the hermit crab caterpillar retreats into its camouflage leaf case for protection. The case is purposefully spacious so the caterpillar can turn around and stick its head out the other side in order to reverse direction. To make things even more unique, this caterpillar moves along by using its mouth like another set of hands. Pretending to be a leaf is a very effective means of camouflage. The leaf case is not a single rolled-up leaf, but two pasted together in order to create the characteristic shape. The case is made of two different leaves. The team consulted insect experts, who think this is a totally new species of moth. The camouflage disguise and way of moving could be unique among Lepidoptera species. This unusual creature just shows how amazingly diverse the Amazon rainforest is, and how full of undiscovered species it must be. 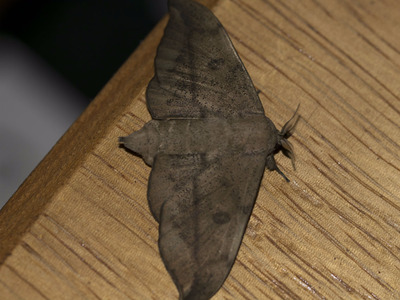 The adult form of the moth, which is likely to be a member of the family Mimallonidae. 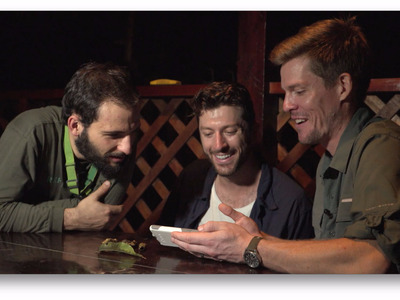 From left to right: Daniel Couceiro, biologist at Rainforest Expeditions, Aaron Pomerantz, an entomology PhD student at UC Berkeley, and Dr. Joe Hanson, biologist and host of It's OK To Be Smart. When Hanson brought the caterpillar back to camp, the rest of the team were fascinated. It led them to wonder how you can actually know whether a species is newly discovered. The team review the day's discovery. 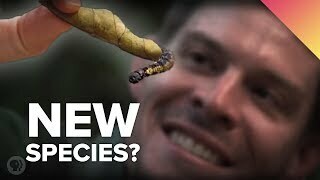 So they investigated the question by asking experts, and created this video, which explains the difficulties with determining whether a new discovery really is a totally new species or not.